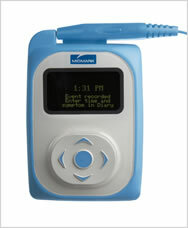 Advanced, compact Holter recorders integrate seamlessly with your computer-based diagnostics. These compact, ultralight Holter recorders will integrate with your Midmark PC-based diagnostics, and allow you to capture 24-hour 5-lead or 7-lead Holter recordings on your patients, and see all of the data laid out for analysis on your computer. The Holter recorders are easy to use, and easy for your patients to carry around. The Midmark IQholter combines ease of use, beautiful simplicity in design, and extraordiary accuracy in its readings ... and puts it all directly into your computer system, where you can even integrate it with EMR if you like. Includes the standard features of IQholter with expanded functionalities for A-Fib, QT/QTc and HRV analysis; Template editing; Smart Page Scan and more. Includes all features of IQholterEX plus Pacemaker detection of single- and dual-chamber paced beats for non-captures and sensing failures. Lighted Display: Verify live ECG tracing quality during hookup. Real time clock for patient diary. rate trend, ST trend, etc. Step into the 21st century. Midmark has made PC-based diagnostic medical equipment the newest and most effective generation of devices for your practice or facility. And with the industry moving steadily (and inevitably) toward EMR patient data management, where everything is going to tie in with your computer systems, this is the perfect time to incorporate the new line of Midmark systems into the way you care for your patients and maintain your records and documentation. It's never been easier. And there's never been a better time or opportunity. Midmark leads the industry in everything it does. PC-based diganostic medical equipment is here, and Midmark is leading the way — setting the Gold Standard everyone else will be trying to match.